Perfect presents for film lovers. LUMIERKA is a gift card charged with a credit which you can use to buy tickets to any shows in Kino Lumiere. You can use the credit upon 12 months from the cards release date. With LUMIERKA you can pay for any tickets to arbitrary public shows in Kino Lumiere, which are sold at the cinemas box office. By LUMIERKA you can pay arbitrary amount of tickets, even to one and same show - upon the disposal credit on the card. Attention! 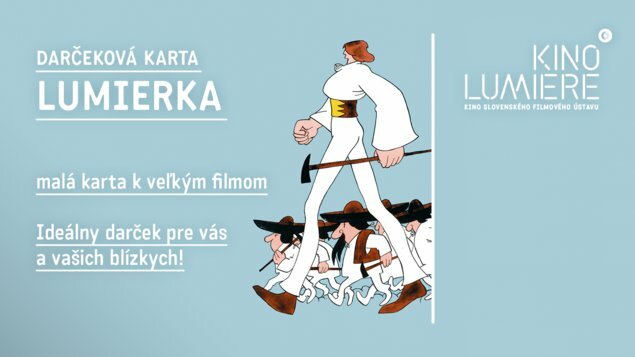 With LUMIERKA you can see almost all the Archive cinema shows only for 1 €! The only condition is that you need to buy your ticket in person at our box office with a valid LUMIERKA gift card.